Earn 149 SATVantage Rewards points with this purchase! ClearStream antennas represent a new breakthrough in size and unmatched ultra efficient design and directionality. Advanced design software allows these 20” x 28” antennas to be smaller and powerful across the core UHF DTV spectrum offering consistent high gain. This advancement in antenna efficiency allows up to 98% of the available broadcast signal to actually reach the incoming antenna cable rather than being lost to impedance mismatches. 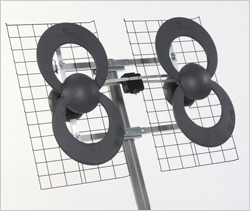 The ClearStream4 Quad-Loop design receives all core UHF DTV channels available with a range up to 65 +miles. They are engineered for extra strength and durability, using anodized aluminum for corrosion resistance and are easy to assemble.